Highlights of Upgraded Grow Light: Different with old version,this type of 45W grow light newly added UV leds and IR leds,which are absolutely indispensable for plant and vegetable to grow well after our professional engineer department tested. High Efficiency Performance: Low power consumption but high luminous efficiency, long service life about 50,000hrs. Red leds: 161pcs with 650-660nm;Blue leds:56pcs with 460-470nm;UV leds: 4pcs with 395-400nm;IR leds: 4pcs with 730-735nm. 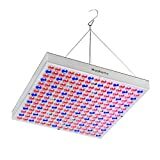 The Perfect Replacement of Sunlight: Full spectrum with Red/blue/UV/IR 4 peak Wavelength supply plants?Veg and Flower all stages with everything they desire in the natural sunlight. Versatile: Suitable for greenhouses, plant factory, greenhouse farming, flower farming, indoor gardens, soluble breeding, pipeline cultivation, farm, potted plants, spray the plant, tissue culture and so on. Kindly Note: ①There are respectively 4 UV lights and 4 IR lights which normally looks like more dim even like damaged than other lights, just please do not worry, the dim condition is their physical characteristic. ②100% warranty with 30 days money back,12 months return guarantee and 24 hours after-sale response. Hoohome Grow Light: Bring the sun into your house, and take a good care of your plants, fruits and flowers. Red LEDs: 161pcs with 650-660nm wavelength, rich sources in red light are more efficient and beneficial for photosynthesis, best for flowering and seed production. Blue LEDs: 56pcs with 460-470nm wavelength, blue light is more necessary for Chlorophyll and Carotenoid, good for the photosynthesis, best for promoting the stem and leaf. UV LEDs: 4pcs with 395-400nm wavelength, it is good for seeding and sterilization. IR LEDs: 4pcs with 730-735nm wavelength. Please kindly note that the light looks very dim for both UV LEDs and IR LEDs, and it’s good for plant bloom, please don’t worry. 1. Extremely bright, do not look directly at the LED bulbs when the light is working. 2. Indoor use only, not water-proof. 3. For the sake of prevention of fire and explosion, stop using the bulb once overheat. 4. To avoid electrical shock hazards, please shut off power before installation.